The final grade calculator is a tool that will help you calculate your grade point faster. One important use of the tools is to help you calculate the points required to make a desired grade point. It is quite tasking to have scores from different courses and subjects computed. To make this task easier we have compiled a list of the top ten websites for calculating your final grade points. At the end of every semester, students become friends with their calculator and start messing with the term weighted grade points or GPA as the case may be. This scenario occurs mostly towards and after a finals exam. With the final grade calculators online, all you need is to input your desired scores or actual scores to get the grade scores. In future we would provide a final grade calculator on this site. We have compiled some of the very best final grade calculator sites online. But before we go on to the business at hand, lets deviate a bit to learn how to calculate final grade. To calculate your final grade you have two main options, you can calculate it manually or with an automated calculator. The data you need to input into the calculator may be projected or desired score and the other is the actual final grade score. To begin you need to do the following. Write out your desired scores. Write out the maximum points that can be gotten. Using the grade point template, find the grade point equivalent. The point system can be in the following format, this is used to determine the grade point gotten. University of Ontario – Institute of Technology Online Final Grade Calculator. This calculator is a simple and scalable Online Final Grade Calculator, it has the features desired on my most students. You can add a alloted max mark and a score value in percentage, you can add your current grade and adjusted grade. It also has allowance for adding additional exam or assignment details. To read the documentation on how to use the UofO grade calculator, check it out here. 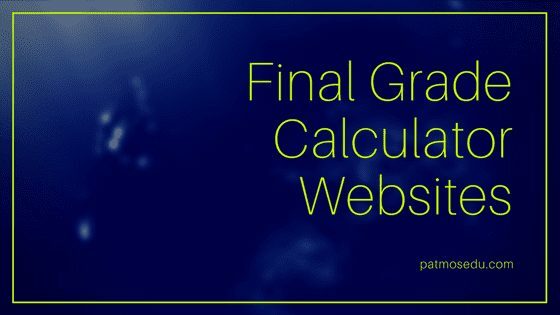 This final grade calculator site has one of the simplest interface, it allows you to select desired grade, current grade and weighted final %. Then you will add out of row %. The site has examples and resources that will help you calculate your scores accurately. The site also contain calculators for College GPA calculator, High School calculator, and tips on how to calculate and increase your GPA. This is probably the most famous online final grade calculator. This site is simple and flexible, it has a grade calculator and also a final grade calculator. Also with a clear example on how to calculate your final grade score. Required grade is 80% (or B-). So the final exam grade should be 90% (or A-). The site information on grade calculation, GPA calculation, GPA to letter grade and vice versa. Knowing your grade point can help you prepare for well for exams, and also avoid near miss of an higher grade point. This is a straight forward calculator that can be used to make a quick grade decision, it also has a quick guide to direct you on how to populate the values required. Roger has also been of good help to users of the calculator by responding to their queries and comments. You need to provide your current grade, the least grade you want and finally the worth of the final. This site is used by thousands of students globally, the site has a step by step process of calculating a final GPA score. Provide the score and the % of Grade, this is followed by the Grade in letters and the required average. Finally the score is displayed, in the third step. I believe this final grade calculator provides more insight into how to accurately calculate your final grade scores and GPA. This does not underscore the value of other online final grade calculator. Calculating your final grade points and score manually can be demanding and prone to errors. If you prefer manual calculation, you can double check with the online final grade calculators. I wish you all the best in your forth coming exams and also pray you prepare well to get the best scores.